Dr. Maddahi may prescribe the venus duplex ultrasound to look for blood clots, check for enlarged arteries or to locate the source of varicose veins. Blood clots can cause strokes and heart attacks and pulmonary embolism. This test is simple, non-invasive and a screening for blood clots can save your life. 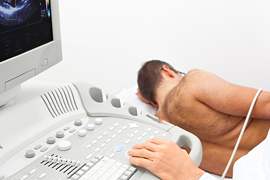 Contact our office for instructions to prepare for your venus duplex ultrasound. We will prepare instructions that are tailored just for you. We ask that you tell our office about any medications (prescription or over the counter) you are taking. We will also need to be advised of any medical devices, or implants you may be using. Los Angeles cardiology specialist Dr. Maddahi will provide advice on continuing medications, special precautions for devices and if fasting is recommended. This test is non-invasive and involves your laying still on an examination table. We may dim the lights so that we can see the monitor screen easily. We will use a wand called a "transducer" to see your veins. To perform the test, a small amount of gel is placed on the area to be scanned. This gel ensures that contact is kept between your body and the transducer. We will pass this wand over your body several times to take pictures or video of your veins. It is just that easy and painless. Call us with any questions or concerns you have about your test. Dr. Maddahi and our staff will work to make your experience easier. Your images are recorded and analyzed by Dr. Maddahi. If any abnormalities are found, Dr. Maddahi will prepare a plan to get you on the right track for a healthy heart. Use of the venus duplex ultrasound is just one of the ways Los Angeles cardiology specialist Dr. Maddahi helps prevent his patients from going through the pain and suffering of heart disease. He prefers prevention rather than rescue in his practice.